Tonight was our first bunco party! I have been so nervous about it all week but I think it turned out really good. We had 17 girls come and I had a good time seeing all of them!!! I'll be looking forward to the next time! I rushed home and got the tables all set up - scorecards and dice! These were the prizes for the three winners. I went to a local gift shop that wraps - I think the wrapping made them look extra fun! I meant to take lots of pictures of everyone but once we got playing - I just totally let it slip. I wanted to get a group shot but never got to that either. This is Jessica, Ginger and Kacy. Laurie is on the phone because Sarah Kate was not having a good time at home with her daddy. Scott went over to their house to hang out with Steve and help him keep the girls and Steve called about half way in and I could hear Sarah screaming. It's funny to me to think about them trying to keep those girls. Hurricane Ike is really messing things up this weekend. Arkansas was supposed to play at Texas this weekend but that has been postponed. We were going to go to south AR to visit my in-laws but we don't want to drive in torrential rains so we are postponing that trip a few weeks also. Mostly I'm just praying for the people in Houston and Corpus Christie. I hope Ike calms and doesn't cause too much damage. I know there are so many of you in Texas and I'm thinking of you. It looks like AR will have rain for the next several days. Our lawns and trees certainly aren't dead and dying like they normally are this time of year - we have had so much rain. Have anything fun planned for this weekend????? I will have to get you the recipe for creamy tacos. It makes enough to feed a large crowd like you had for Bunco. It is yummy too! We have Bunco in our neighborhood and I just love it. We are dreading the weekend of rain too. Maybe we can get caught up on some sleep though. I have been following your blog for a few months now....I haven't the faintest idea how I found you but I have loved keeping up with your pregnancy. I just wanted to say how impressed I am with all you did for your bunco party! I can't imagine doing all of that after working a full day. WOW! What a lucky little girl you have! 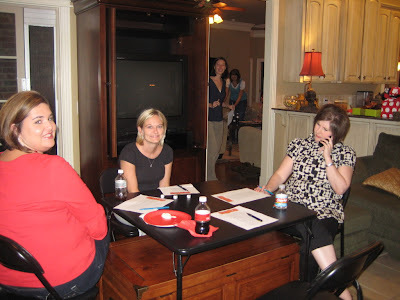 Bunco was fun--you are very fast at getting pictures up! The food was great--appetizers were perfect. Oh my word... I LOVE SSD. I just get giddy when I go in there! Looks like y'all had so much fun! It looks like y'all had a lot of fun tonight! I love bunco! I get a little too into though, which is not like my personality at all. I have no idea what comes over me!! Our plans for the weekend changed a little thanks to Ike. We are still having our Small group fellowship Saturday night though and we are doing baked potato bar so that should be a lot of fun!! How fun! Glad ya'll had fun! I love that you had little pumpkins for decorating! And i want to know what those gifts were! I LOVE Signed Sealed Delivered! Ok, from the score cards, to the food, to those amazing wrapped presents - I think you are the best Bunco party planner ever! Never played Bunco... but it looks like fun. At least the eatin' and visitin' does! Lots of quiet and much relaxing on the agenda this weekend. 1.) 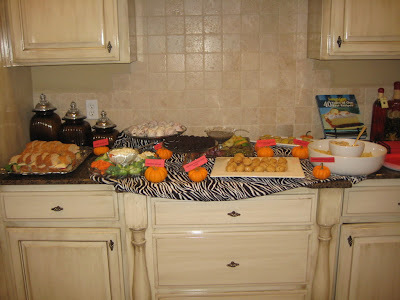 I LOVE Bunco and I had a friend that did a pink theme night (food, drink, prizes, attire)! 3.) We are "hunkered down" as they keep saying and trying to keep safe with our little baby girl! My entire family lives in Houston...so I am stressed about Ike. My best friend is off from school today and my parents spent the day boarding up the house. For now, they plan to stick it out and stay at home. But, they have a motorhome, and if it gets too bad, they'll travel to my grandparents home in Brenham. Hmmmm ... we are having an AWANA Leaders party in a few weeks and the girls are supposed to play BUNCO .. maybe I should Google this game and find out what it's all about. This weekend, we were planning on going to the Oklahomam State Fair but it looks like Ike might wash away those plans. Hope you guys find a way to salvage the weekend despite the change of plans. It looks like you all had a great time! I love Bunko (our group spells it with a 'k' :)). It was so nice to meet you at Wal-Mart the other night! Cake Balls? Can you share that recipe? The party looks like so much fun! I wish I had girls to get together with like this. OH...I love cakeballs!! Kelly, you are the hostess with the mostess. Brilliant job on the bunco night. - Take D to a retired horse farm to feed carrots to the horses (he loves animals). - Watch football while eating chips with a variety of yummy dips! Thanks for your sweet prayers for all us awaiting IKE. I am really nervous...it should be here in the early morning. I just pray my sweet Emma sleeps right through it. We will probably put her in our Master Bedroom Closet and I will stay in there with her, while the HOTY keeps his "eye" on the "eye" of the storm. If the grocery store were not so crazy, I would be running out to get the stuff to make your red velvet cake balls...yummy, oh and the little Hawaiian Bread Sandwiches! You know what? I might go to the store and just fight the battle...14 weeks of pregnancy has me craving some good stuff. Looks like Bunco was a huge success. What were the beautifully wrapped gifts? I am a sucker for great wrapping. You did a wonderful job on everything and I am probably going to borrow the little pumpkin idea...I love it. We always label things at our gatherings too. Have a wonderful weekend. Our plans are to stay dry, safe, play with the "itty bitty", pray, scrapbook, work on babybook, blog and if I can get to the store...use some of your wonderful recipes. Keep Harper dry! What other food did you serve? Everything looks very yummy! All the food looks yummy! What were your door prizes? Just the wrapping makes them worth winning!! We will be getting ready for Ike to hit tonight. I think we are ready with food, water, and a cleaned up yard. Not much more we can do but keep the kids entertained and pray! Thanks for your fun blog--I love it! Football!!! Also I'm eating at IHOP (I LOVE BREAKFAST) with my friend Sarah...she's pregnant too...she and her husband Aaron travel a lot so I never get to see them. So that's my excitement for the weekend. I'm praying for Galveston, they are expecting devastation. This is a big one! P.S. Since your game is postponed you can be an honorary UGA or Bama fan for the weekend :) But in 1 week we'll have to be enemies for a few days. Kelly, I really want the recipe for the red velvet cake balls. My hubby loves red velvet cake and they look so yummy! Also when I lived in Tampa I use to play bunko once a month with a group of girls. We rotated houses (There were 12 of us, so one person got one month, That person was responsible for snacks, gifts, and some kind of favor for each girl.) It was always fun, we set themes up for each time. Like once was a pajama party and everyone came dressed in their favorite pjs. Just some ideas for you parties. We are busy doing football and baseball with the boys! My parents are coming too...I'll take lots of pix. Glad all is good with ya. Got you in my prayers. I am so happy that your first Bunco was a success ;)! Is it not the funnest game ever?!?! I am sorry to hear about all of your change in plans, but I hope everyone is SAFE! 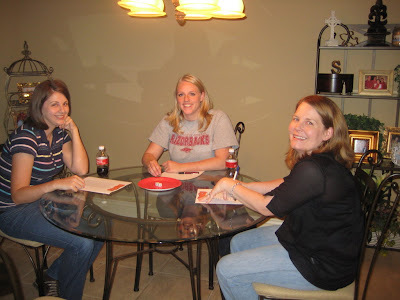 Glad to hear & see that your Bunco Night turned out fun! Hope you guys had a great time! I totally LOVE how the presents turned out. That does give them a little extra something special! I wanna be in your Bunco group!!!! Looks like you had a fun time. Hope Laurie was able to stay and enjoy herself...I remember those days. I love Bunco! We have a small group that came out of my MOPS group. You are definitely the best party planner! I love how you used the little pumpkins. We're focusing on potty training Brady this weekend, so we don't have a lot planned. Some friends from church are coming over Saturday evening (their daughter is Brady's friend) and church on Sunday, but that's it. Wish us luck! Looks like you girls had a fun time. The veggies and dip look so good right now, and it's 9:57 am! Looks like a successful Bunco night. Love the wrapping job! P.S. I got my polka tot swatches yesterday. I'm in love with all of them. I don't know how I'll ever make a decision! I LOVE Bunco! I'm in a Bunco group with some of my dearest friends and it is probably one of my most favorite nights of the month...something that we always look forward to. And if you want to add a little more fun into it...have themed Bunco nights...like Hawaii night, or Green bunco for St. Patrick's Day in March, or of course a costume Bunco for October...its always so fun to see your friends dress up! But I'm so glad it turned out well! Fun! It looks like ya'll had a great time! Everything looked wonderful - you are the ultimate party planner, my friend. Hope you are having a great Friday!! Actually yes....A Betrothal Ceremony! My youngest is the flower girl. It will be interesting. It was going to be a full fledged wedding..but some issues came up (the bride is in poor health, and needs more surgeries)..for insurance reasons..they found out recently they couldn't get married. so instead of calling it off.. Its a betrothal ceremony..kind of promising to get married when possible. Mary and Joseph did this. It will be interesting!! Your presents look so beautiful! You are a wonderful hostess...looks like everyone had fun. I work a pt job along with my ft...so I'll be working this weekend. I really enjoy it, so it's not a lot of stress. Yes, let's be praying for the residents in Texas! i can't believe this but.......i have never played bunco!!!!!!!!!!!!! isn't that terrible!!!!! but your house looks so wonderful and I am so glad that yall had a great time!!!!!!!!!! love love love how you set up the food!!!!! You always throw the most fabulous parties! 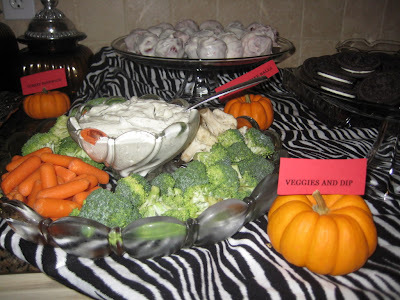 You really are quite the creative hostess - love the food and decor! 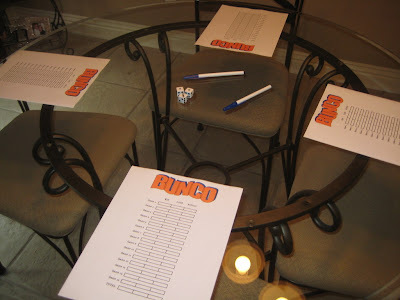 Looks like a fun night - it makes me want to have a Bunco night! 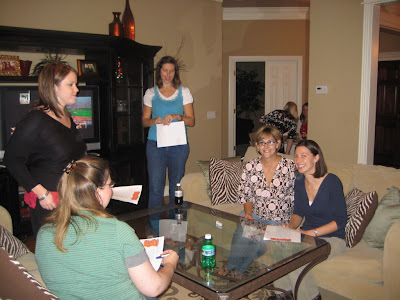 I have never Bunco'd and your pictures are making me want to find a Bunco group. It looks fun! Our plans this weekend also included watching the Texas/Arkansas game. My husband and I have no idea what we will do now that our Saturday afternoon has been rescheduled. Life centers around Longhorn Football in this house. I did buy cookie mix to do with my daughter. The Austin area may not see rain as they originally thought. Guess we will see tomorrow. Manwhile, everyone else in the path of the storm is in my thoughts and prayers! I always love checking your blog and keeping up with you! I was just telling a family in our church your story. Their son and daughter-in-law just suffered a miscarriage. They actually live in AR and their son just won the college fishing tournment for Arkansas University. I plan to pass on your blog to their daughter-in-law. My plans for the weekend are to go cheer on the Gamecocks and watch them play Georgia. Hopefully they won't look too bad! Although they did look really bad getting beat by Vanderbilt. You are a great hostess! I love the little pumpkins...too cute! This weekend my sister is coming from Colorado to visit. It's the first time she's been able to come since we moved to Round Rock. I'm so excited to see her and have some girl time! 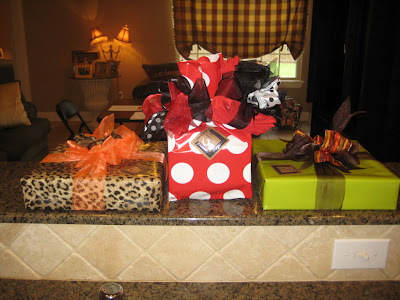 You cannot go wrong with gifts from SSD - I can notice that tag a mile away!! That is my FAVORITE store!! Have a great weekend!! My fun weekend plans involve getting my hair done! Woo-hoo!! And helping my friend lead praise and worship at a 4th & 5th grade retreat. Those little pumpkins with the food signs are TOO CUTE! I think you are the "hostess with the most-est" for SURE! The presents look so cute and everything just looks so fun! I am halfway dreading the rain this weekend, and halfway looking forward to the excuse to stay in and watch movies! It looks like y'all had a great time! Hope you have a great weekend and stay dry! My plans are to stay off my ankle and watch some football. I love love love the pumpkins as label holders!!! I will have to borrow that idea!!! You are looking great!!! I love Bunco! The party looks so fun! I've never heard of cake balls but they looks like they are ideal for a big group like that. So creative!! I'll definitely need to try your recipe this season when I find myself always looking for new and tasty treats.